It’s rather odd, and certainly something I’d never expect, but my wiki gets more hits for the flip factor Series 60 phones than the “normal” ones. Maybe these results are skewed at the moment by the leaked N71 but it’s still a little puzzling, surely the 6680 or the E70 are more worthy than the crap-tastic 6260? I’m probably biased, possibly because in Europe most flips are rubbish phones, either low end and/or ideal for fashion victims (RAZR, I’m talking about you). Given this prejudice it’s hard for me to get excited about any flips, take for example the Panasonic X700 – I’m told it’s a pretty good phone, but god it’s bland looking. The N90 isn’t bad spec wise, and the screen is gorgeous, but it’s bigger than a big thing and the 101 ways to fold it makes advanced origami seem trivial – incidentally I’d love a picture of an N90 looking like a swan or a pirate’s hat! Is the N71 going to make me change my mind? I don’t think so, and the few remaining pictures in circulation (Nokia’s lawyers have gone on a mad C&D spree) make it look very like one of the Japanese FOMA phones. I half suspect some mad swivelling action going on with that keypad, this is after-all Nokia, and a simple hinge appears to be a red rag to their designers, do their designers have four knees and double jointed elbows? Perhaps we should be told! Still, we shall see what happens next week, if the phone really is announced at Nokia’s Mobility Conference in Barcelona. 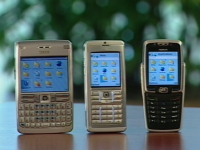 Personally, I’m looking out for the Nokia N80, the next slider from Nokia. This week's adverts. Week 43 2005. Feet up! has 0 adverts this week. So, what's this entry all about? There's an explanation here about what I'm calling my feed ads and more of my thoughts on adverts can be found in my blogging/adverts category. Advertise on Feet up! to keep Jim in beer and nice toys. Russell Beattie Notebook – Online Aggregators and Search Engines: Copyright Thieves? Find Cheap flights from and within the UK – Who Goes Where? Russell and Carlo over at MobHappy have a new initiative The Carnival of the Mobilists aimed at encouraging and rewarding great mobile technology writing. There’s some really good writing on mobile technology sprayed around the web and some of the high traffic sites aren’t as interesting or incisive as many of the lone bloggers, I’ll mention no names but one of the big name gadget-blogs gets a regular panning on #mobitopia for their ill-informed US oriented mobile technology reporting. Hopefully, the Carnival should swing the spotlight onto the really deserving well-informed writers, I’m sure that’s Russell and Carlo’s aim. The first carnival took place (rightly enough) on MobHappy, and this week the event moves to Oliver Starr’s Mobile Weblogquite a movable feast, no? Well, who honestly saw that one coming? Rumours of a series 60 device with a Nokia 6822 style keyboard had been floating around for ever, but for Nokia to spring a surprise announcement at the Smartphone Show and announce it as one of a range of three new business orientated devices with 3g and WiFi, like wow! The device of desire has to be the E70; hey baby, it’s got wings! It’s the only Eseries phone with a camera, a 2 megapixel device probably similar to that on the N70 and N91. After moving from the N-Gage to the 6680 I’m not going to make the backwards step to a blind device again. But, that’s not going to stop some people, the Blackberry slaughtering E61 (killing doesn’t begin to sum up this niche destroying device) will be on most IT departments’ hotlists, even if it has the lowest resolution of the three Eseries phones at a mere 320 by 240. And the office junior, the unassuming E60, on bare specs it’s not quite as interesting as the E61 or the E70, but it’s going to be the biggest seller, say night night to the elderly but near ubiquitous Nokia 6310. A little Blue Sky thinking here, based on one simple premise, when did you last watch a webcast for a major event that wasn't jerky, partially inaudible, and/or had the connection drop out? Maybe I'm unlucky, but I've sat on the end of very fat pipes with great connectivity and still had this miserable experience. If TV was like this it would never have reached the general public. Multicast a la the Mbone is one way around this problem, but it seems to have become an historical curiousity. The main problem with webcasts are the use of a single point of distribution to many players. At the end of the day a single point can only distribute to a finite number of players, bandwidth and processor cycles dictate this. Unless one were to reserve near-infinite resources at an exorbitant cost one could not guarantee that the servers would not be overwhelmed. However, another - perhaps brute force but simpler in some ways - approach would be for multimedia players to effectively place a near zero impedence load on the distribution of a signal, for each player to try to pass on at least as much as it received, similar in a way to any of the peer to peer networks. It sounds trivial, and I know the implementation won't be quite so simple, but given the choice between a watchable webcast delayed by 45 seconds and one you can't connect to, which would you take? I know that a number of people are working on solutions like this, and conversely there are vested interests and inertia towards maintaining the status quo, but it's something to bear in mind next time you try to connect to and try to watch an important webcast.